A blog dedicated to learning data science techniques by applying them to real world data. Welcome to the final post in our Pokemon Go analysis series. Last time, we cleaned up our tweet collection before counting tweets from each Pokemon Go team in every state. We used the fraction of tweets about a particular team as a measure of the dominance of that team in the state, and performed a statistical analysis to account for errors in our measurement. In this post, we’ll use Python’s Bokeh and Basemap libraries to visualize our results in a Choropleth map. Before we begin, we’ll need to load the data analysis results from our previous post. A Choropleth map divides geographic areas into distinct regions, and colors those regions to visualize patterns in your data. 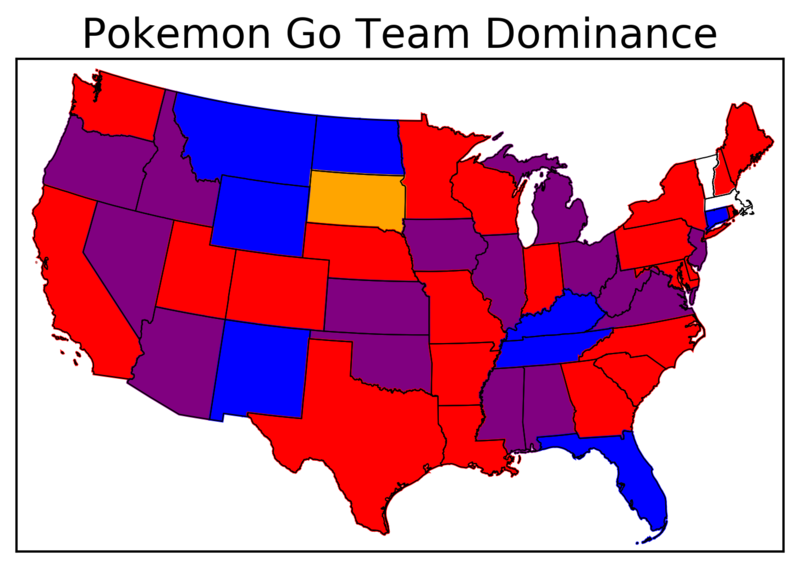 We can apply this technique to our data to visualize the dominance of each Pokemon Go team in each state. We’ll begin with a map of the United States, with boundaries drawn at the state level. The fraction of tweets referencing each team in a particular state will tell us how much red, yellow, and blue (RYB) to mix into the color of that state. For instance, if a particular state has an equal number of blue and yellow team tweets, but no red team tweets, we’d like to color that state green. We’ll need a legend that indicates what each color on our Choropleth map means. Imagine a triangle whose center lies at the origin of a coordinate system. 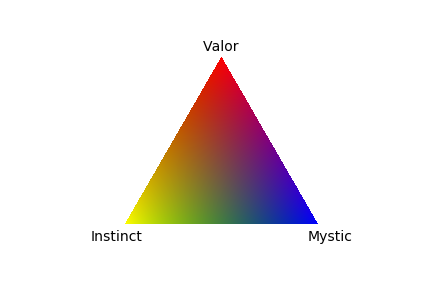 The top of the triangle, at , can represent the red color of our map when we only have Team Valor tweets. The bottom left of the triangle, at , can represent the yellow color of our map when we only have Team Instinct tweets. The bottom right of the triangle, at , can represent the blue color of our map when we only have Team Mystic tweets. To fill in the rest of the triangle, we loop through each possible combination of red team, yellow team, and blue team fractions. We determine the x and y coordinate of each combination by treating the individual red, yellow, and blue components as a vector and adding the individual vector coordinates together. We then use our RYB_to_RGB function to determine the RGB color of those coordinates. #Multiply `y_coord` by `pixel_num/2` to take up all pixels in our canvas. #Shift everything up by pixel_num/2 to put y=1 at the top of our canvas. There are a number of Python libraries we could use to produce our Choropleth map. In this section, we’ll use Python’s Bokeh library. The Bokeh library provides a variety of tools to produce interactive visualizations of data in an html format. Compared to other plotting libraries such a matplotlib, including interactive functionality with Bokeh is a breeze. First, we need to import a number of tools from the library. The statesData object we just imported is a dictionary. The keys for the dictionary are the abbreviations for each state, and the values of the dictionary define the boundaries of each state by using lists of latitude and longitude coordinates. We’ll want to extract the coordinates of the boundaries. Next, we need to determine which color to assign to each state on the map. To do so, we simply use our RYB_to_RGB function to convert the fraction of tweets about each team to an RGB color. Bokeh will want the final color denoted in hexadecimal, so we’ll also need to use matplotlib’s rgb2hex function to convert the RGB color to hex. Recall that we produced two data frames during our statistical analysis — one in which we removed negative tweets with our sentiment analyzer and one in which we did not. We did this because our sentiment analyzer only improved our measurement errors if we collected 50 or more tweets about a particular Pokemon Go team in a particular state. We distinguished states in which our sentiment analyzer improved our measurement error by marking the “Improved” column as True. When we determine the color of each state, we’ll want to extract the team dominance information from whichever data frame has smaller measurement errors. A Choropleth map is a nice way to visualize our data, but it can be difficult to interpret the precise meaning of each color on the map. Therefore, we’ll want to display the exact fraction of tweets referencing each team when a user places their mouse over a state. To do so, we’ll need to place the team dominance measurements, and errors on those measurements, into separate lists for later use. Now that we have our data organized and ready to feed into our Choropleth map, we begin to draw the map by creating an empty figure. We can import all of the information we collected above into Bokeh by feeding it in a as a dict to Bokeh’s ColumnDataSource method. Now, we can tell Bokeh to fill in patches of color in between the x and y coordinates of each state. Once we declare our data_source object as the source of information, Bokeh will be able to extract the x and y coordinates of the state boundaries, as well as the color we assigned to each state, by referencing the data_source dictionary keys. We can include the mouse over functionality we previously discussed using Bokeh’s HoverTool method. The tooltips method allows us to specify which information we’d like to display during a mouse over. In this case, I chose to show the state name and the fraction of tweets which refer to each team (along with the errors). After constructing the Choropleth map, we simply need to save it as an html file and tell Python to display the result. Instead of coloring the Choropleth map according to the fraction of tweets which reference each team, we could color the map based on whichever team has the highest fraction of tweets in a particular state. Such a map would not need mouse over functionality, since the distinct red, blue, and yellow colors would be easy to understand by eye. We could modify the Bokeh plot code from the previous section to achieve this, but since we don’t need the plot to be interactive this is an opportune time to introduce one of the other libraries which allow us to produce Choropleth maps. First, we need to determine which team “owns” each state. We do so by comparing the fraction of tweets which reference each team in a particular state. If the fraction of tweets referencing a particular team is higher than the fraction of tweets referencing each other team, we record the color of that team in a new “Dominant” column. If there is a tie, we simply mix the colors of each team together. For instance, if there are an equal number of Team Mystic and Team Valor tweets, and both are larger than the fraction of Team Instinct tweets, we color the state purple. Note that statistically, we can only say that the fraction of tweets about a particular team is higher than the other teams if it exceeds the fraction of tweets about each other team by more than our measurement error. We’ll use the Basemap library to make this simplified, non-interactive map. First we need to import the library and some of its functions. projection set the method for projecting a curved surface (the earth) onto a 2 dimensional map. Next, we’ll load a set of shapefiles that define the boundaries to draw on our map. We’ll need to find shp, sbf, and shx files that define the boundaries that we want use. In this case, I used the “st99_d00” shapefiles from matplotlib’s Github page. To load the shapefiles, we use the readshapefile method. The first argument of this method is the name of our shapefiles (without any extension), the second argument assigns a name to access the shapefile information in our code, and the third argument tells the map that we want to draw solid lines between each of the boundaries. We can access the information that our shapefiles imported with the m.states_info class member, where the word states will be whatever the second argument in readshapefile was set to. To color in each state in the map we loop through the shapefile information, extracting the state names and creating a dictionary of colors which we wish to associate with those state names. Once we’ve built the dictionary of colors for each state, we use matplotlib’s poly and add_patch to color in each of the boundaries defined in by our shapefiles. If we only look at the basemap result, we see that Team Valor is the most dominant team in 23 states. Team Mystic claims eight states, and ties for ownership with Team Valor in 18 states (including Puerto Rico and DC). Team Instinct seems less popular, only having shared ownership of three states. In two of the states, we could not say that any particular team owned the state with statistical significance. The popularity of the Pokemon Go teams are not as one sided as the Basemap would lead you to believe. Our interactive Bokeh plot shows that the majority of states are tinted purple when you account for the fraction of tweets from every team in the state. 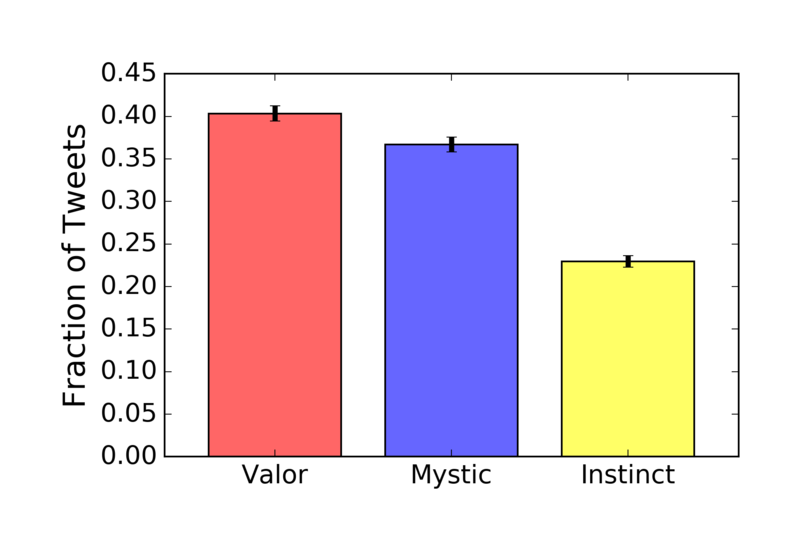 This indicates that even though Team Valor is the most dominant team in many states, Team Mystic is a close second in popularity. In fact, if we look at the total number of tweets about each team, regardless of the location of those tweets, we see that Team Valor represents 40 1% of our tweets, Team Mystic represents 37 1% of our tweets, and Team Instinct represents 23 0.5% of our tweets. It too a lot of work, but we successfully used Twitter to quantify the dominance of the Pokemon Go teams in each state. Along the way we learned details of the Twitter API, and how to use Python’s Tweepy library to interface with the API and collect tweets. We built an understanding of Naive Bayes Classifiers, and trained one to classify the sentiment of each tweet that we collected. We used the sentiment analyzer to remove negative tweets from our collection, along with the multi-team tweets, and repeated-user tweets that we removed with Pandas. With the cleaned data, we performed a statistical analysis to determine the dominance of each Pokemon Go team in every state while properly accounting for errors on our measurement. Finally, we visualized discussed our results in this final post. Congratulations on making it through the seven-post series. If you learned anything useful along the way, or have any questions about the topics we covered, feel free to leave a comment below.